We do not recommend P. BOXES - PLEASE PROVIDE A PHYSICAL ADDRESS. We advise you to use a reputable carrier service when returning your goods. Please check the Voltage information and make sure it matches the one in your country. In case it's not stated in the description, do ask us. We guarantee that your issue will be solved quickly. We usually respond within 24 hours on weekdays. RWMs 75 series caster features the patented Kingpinless design. The 75 series is recommended for the most demanding applications and is available with up to 3 wheels for higher capacity applications. All swivel sections are supplied with a lubrication fitting for field maintenance. The 75 series is case hardened to provide long service. It will not crack like through hardened or induction hardened construction provided by other caster manufacturers. Patented kingpinless single ball bearing precision machined raceway hardened to 53 Rockwell C minimum. This patented offset precision-machined raceway exerts radial force evenly where there is full contact between the ball bearing and the raceway. RWMs unique design adds more mass at key points. This, plus more thorough heat treatment, provides additional strength and combats brinelling into the core material. The 75 series typical applications include dollies, utility carts, tow line and platform trucks. Heavy duty power towed application seen in tire manufacturing and countless other heavy duty applications. Leg thickness is 5/16 formed steel. 3/4" Diameter axle bolt with lock or slotted nut as required and mounting plate size is 4-1/2" x 6-1/2" x 5/16". 10-1/8" Overall height, 2" swivel lead and 6000lbs capacity - Nylatron HD wheel with ball bearing - 2-7/16" x 4-15/16", slotted to 3-3/8" x 5-1/4" bolt hole spacing for 1/2" diameter bolt - Swivel section features 3" diameter raceway with 1/2 ball bearings, the notched raceway is standard and patented kingpinless raceway design - Laguna blue paint finish. 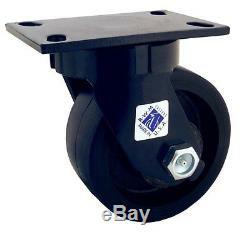 RWM Casters 75 Series Plate Caster, Swivel, Kingpinless, Heavy Duty Nylon Wheel, Ball Bearing, 6000 lbs Capacity, 8" Wheel Dia, 3" Wheel Width, 10-1/8" Mount Height, 6-1/2" Plate Length, 4-1/2 Plate Width. The item "RWM Casters 75 Series Plate Caster, Swivel, Kingpinless, Heavy Duty Nylon Wheel" is in sale since Friday, January 06, 2017. This item is in the category "Business & Industrial\MRO & Industrial Supply\Material Handling\Casters & Wheels". The seller is "intuii" and is located in US. This item can be shipped to United States, to Canada, to United Kingdom, DK, RO, SK, BG, CZ, FI, HU, LV, LT, MT, EE, to Australia, GR, PT, CY, SI, to Japan, to China, SE, KR, ID, to Taiwan, ZA, TH, to Belgium, to France, to Hong Kong, to Ireland, to Netherlands, PL, to Spain, to Italy, to Germany, to Austria, to Mexico, to New Zealand, PH, SG, to Switzerland, NO, UA, HR, MY, CL, CO, CR, PA, TT, GT, HN, JM, AG, AW, BZ, DM, GD, KN, LC, MS, TC, BB, BD, BM, BN, BO, EC, EG, GF, GG, GI, GP, IS, JE, KH, KY, LI, LK, LU, MC, MO, MQ, MV, NI, PE, PK, PY, RE.